I understand that margins, shareholders and annual dividends and all that stuff are important in business but to my mind the only thing that matters is what the angler 'truly' feels when he starts to use his new rod for the first time away from the tackle showroom and how that relationship develops and assists him to hook & land salmon over the following years. A salmon fly rod should be a trusted 'friend for life' and there's not truly too much that's involved in making a good one that's solid enough to not only fish (& play fish) well but also take the knocks along the way. Consumer confidence and product trust are the best & most sustainable 'marketing tools' to my mind. It wasn't that long ago when the big guns were pitching their salmon rods on the 'lightest weight' is best marketing theme. That technically means you're getting more air and less carbon fibre for your money and what happens to the resilience of the rod when you lighten up its structure too much! These days some rod designers have clearly minimal salmon fishing experience or they're not thinking things out well enough when it comes to important factors like fly control at range via sufficient rod length or avoiding a drowned line while playing a powerful salmon. Can you imagine what Georgina Ballantine would have thought of our latest vast ranges of rods which her 'beast' would have no doubt 'splintered' or she'd still be playing it! The commercial theme these days seems to be to create the 'next best thing' a year or two after already coming out with that claim which to my mind doesn't build trust with salmon fishers who are needing good solid advice on what to purchase and don't want to be completely re-sold every few years. 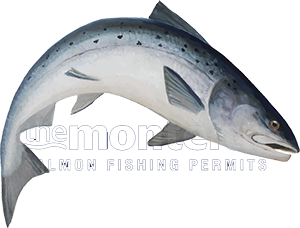 Is technology really moving that fast with fly rod materials and even if it were is the skill set of the majority of salmon fly fishers going to truly see a benefit in that latest material. I think we all already know the answer to that one. Personally I'm a fan of Bruce & Walker and I've known them & used their rods for over 40 years. My favoured outfit for the Tay is their 16ft Norway blank in the 9/10 category & I've got their 11 weight 16ft version too for big tube fly sunk line time. This rod on the Tay beats all the normal stuff for fly control at distance, lifting your fly line to the salmon when the fish is running away at distance to avoid 'line drown' (aye do that with a little switch rod if you could even deliver a 'controlled' fly to a distant salmon lie in the first place! ), plays a salmon magnificently, has a powerful 'through action' for Spey casting for those who've taken time to learn how to 'load' a Spey rod & can take the inevitable knocks all salmon fly rods endure if they are used frequently enough or on a professional basis. I've other rods too which are fantastic to Speycast with and Harrison's in Liverpool build a beautiful 15ft rod for me which is a great all rounder and an excellent tool for teaching proper Spey casting with. I've tried many salmon fly rods over the years and the nicest 15ft rod I ever used was the Daiwa Scottish built 3 piece Altmor which was a truly magnificent piece of kit which was solidly build and if you could load it properly it would effortlessly power a lovely line out as somewhere in the 'power stroke' that rod blank had an in-built turbo charger! I lost most of my interest in salmon rods when the 'broom pole handled Viking sticks' and 'washing lines' appeared but looks like they won't last forever as fishing tackle 'fads' never ever do!